Answer: What kind of trees are those? Yesterday's questions should start to look familiar by now. When given an image and asked something about it that sounds a lot like "location-specific information," you probably want to first check it for EXIF metadata. So I downloaded the image and extracted the metadata from it. First, let's start with the lat/long. I found that it was (37.3648083333333, -122.146610833333). 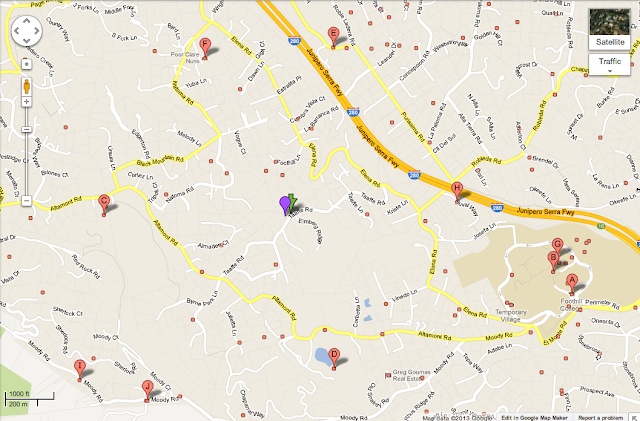 Since Streetview gave me the estimated street address, I tried searching with that, but didn't get especially far. But when I kept rotating the view around, I DID discover a sign at the entrance to the gate leading up to the house. 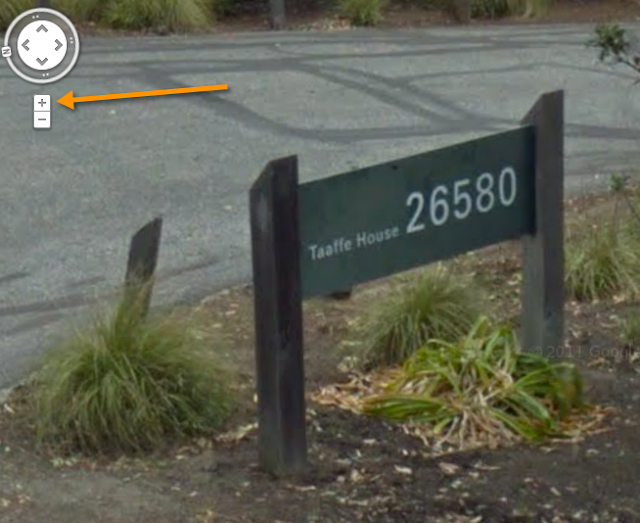 By using the Streetview + tool to zoom in on a portion of the image, I was able to read the sign quite clearly. Strategically, I wanted to find out a bit about the house on the hill, assuming that it might have something to do with the grove of trees in the foreground. Sure enough, in these results I find the Packard Foundation itself discussing the Packard house on Taaffe Road (now a conference center). 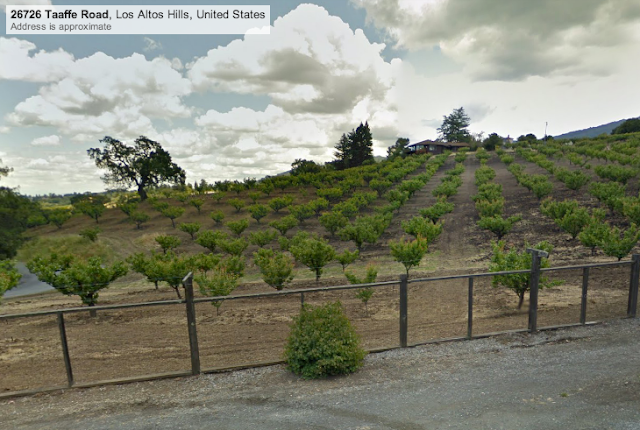 And a bit further down in the results, there's an entry in an architectural data base that describes the Taaffe House as having "70 acres of apricot trees." That just about lines up with my visual estimate of the size of the property. Answer to question #1: Apricot trees, found on several different sources. Yes, searching for as asterisk will put all of the "known entities" for all of the visible map as red dots and push pins (A through F in this illustration). I figured I was looking for a church or a school (the most likely institutions to ring bells). I see that Foothill College in the lower right is there, but they don't ring bells. There's a church (St. Luke's Chapel in the Hills, pushpin H) and there's "Poor Clares Nuns" at pushpin F on this map. and found the sisters' blog with their daily routine and a listing of times when they would ring bells their practice. Answer to question #2: 4:30PM is roughly the end of what the nun's blog describes as "Rosary, Vespers, collation"--so I'm willing to bet that's what it was. A bell marking the end of that step in their daily ritual. (For what it's worth, I also had to look up "collation" and found that it's a light meal. I could imagine that the bell might signal the transition. 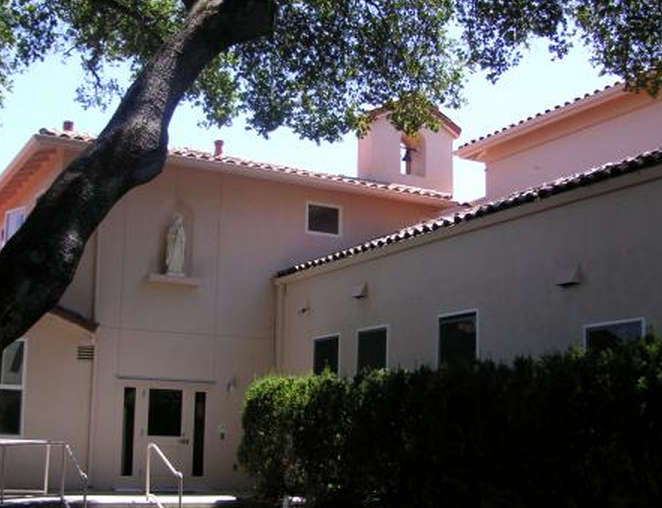 But it's a little unclear if it's the end of rosary + vespers + collation, or from rosary + vespers to collation. Nevertheless, it's somehow signaling rosary + vespers. Here's an image I made from one of the pictures on their web site. (I just cropped and zoomed in a good deal on their original image.) You can actually see the bell that's used to signal events during the sister's daily routine. I found it striking that this lonely sound of devotion would drift across the hills over Silicon Valley and be heard by Packard's apricot tree. But it's also a great thing that you can figure all this out with just a few minutes of searching. Postscript: Interested in the bells, I've ridden my bike up there a few more times around 4PM and ridden slowly up and down the street in front of the monastery. Sure enough, the bell rings repeatedly every afternoon about 4:30, sometimes a bit earlier, sometimes a bit later. But since they're a cloistered order, I don't know that I'll ever find out exactly what the bell signifies. Wednesday search challenge (4/24/13): What kind of trees are these? 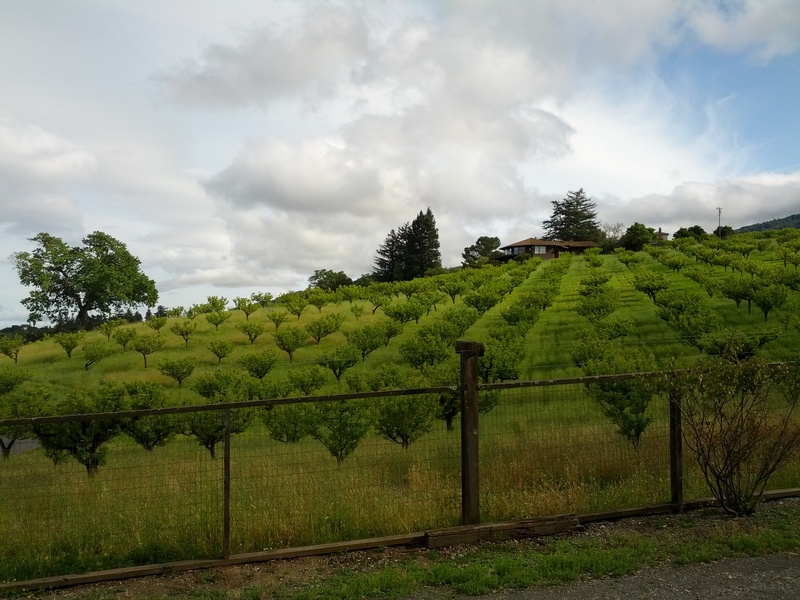 On a beautiful spring day I went for a bike ride up into the foothills of the Santa Cruz mountains, the hills that make up the western part of Silicon Valley. Up in those rolling hills lie fragmentary groves of trees, remnants of the time when Silicon Valley was called "Valley of Heart's Delight." I paused and took the following picture. When looking at it later, I realized that I didn't know what kind of trees these were. The Valley of Heart's Delight was once home to a thriving agricultural industry, but in this particular case, I couldn't identify them through the photo. But after about 1 minute of SearchResearch, I was able to determine a whole bunch of information about this site. Can you? Today's questions, both of which are answerable fairly quickly... if you know how! When to use "Translated foreign pages"? I have some questions about How to do queries. 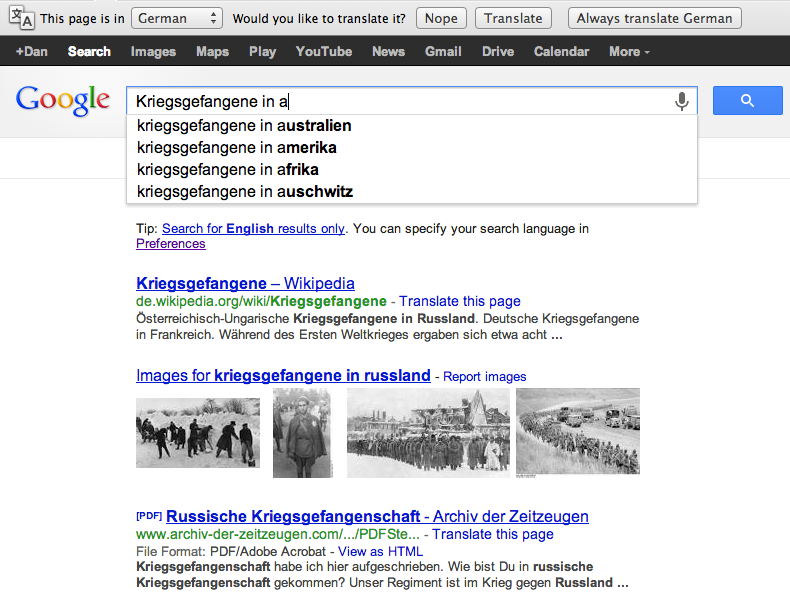 I noticed that you used "Kriegsgefangene in a..." you did not use "german" before Kriegsgefangene to narrow even more the query. That is because of the term of art? and because it is already in german? After reading your answer. 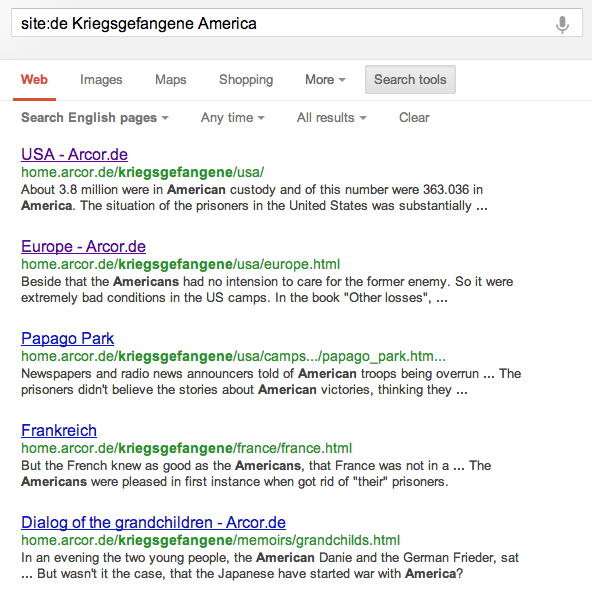 I tried [german prisoners of war america] and then used translated foreign pages in german. Results of your query are much better than my query. My question is: When is useful to use Translated foreign pages? It's good to realize that what Translate foreign pages does is to first translate your query into a number of languages, and then search for THAT query. For instance, "Prisoner of War" is first translated into Kriegsgefangene (German), prigioniero di guerra (Italian), prisionero de guerra (Spanish) etc. and then a search is run for that term (or phrase). In essence, what Google is doing is searching for your phrase in all of Google's languages simultaneously, and then reporting back on the ones that have a decent number of hits. There's a Wikipedia reference, images, the usual sort of thing. Now, let's go to "Translated foreign pages" -- you do it like this. 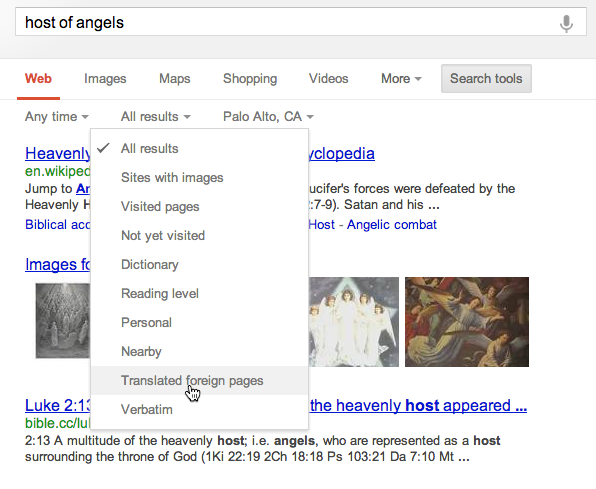 Click on "Search tools" then click on the "Translated foreign pages" option (near the bottom of the popup menu). 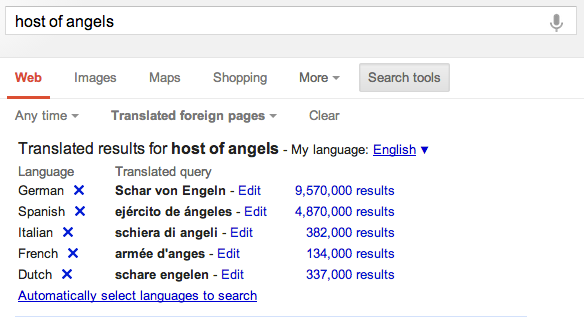 This then gives a whole new set of results, ones that have been found in each of the top four languages for this query (in this case, the FIGS languages--French, Italian, German, Spanish). 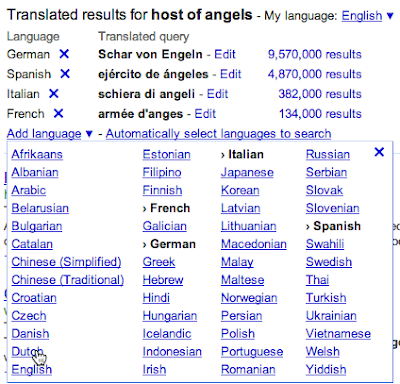 What's happened is that "host of angels" has been translated into German, Spanish, Italian and French, then the search is done in each of those languages, and the results returned. 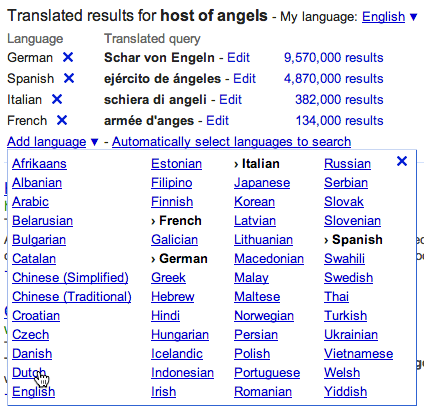 And, as you can see, there are a lot of results in Dutch for the translated phrase "schare engelen" (host of angels). 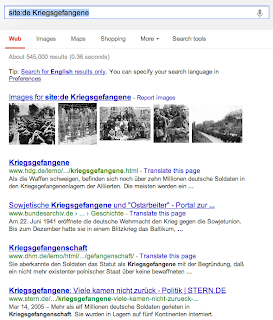 I used the word Kriegsgefangene because I knew that this word would appear in German texts AND I wasn't confident that the English phrase "Prisoner of War" would translate correctly into German. Would it translate as 3 words or as one? Knowing a little bit about German, I was betting, correctly as it turns out, that it would be just one word. In short, I would use "Translated foreign pages" when I had some confidence that what I was looking for would survive the translation into the target language. For another example, think about the Spanish verb compaginar. There is no real equivalent in English (it means "to coordinate schedules"). One might say "reconcile calendars" or a variety of other things in English, but this is one thing to be aware of--does the idea you're searching for exist in the target language? And if so, how is it expressed? Another easy example: there is no equivalent concept of tutear in English. (It means to address in the informal voice, or “tú.”) Since English doesn't have the equivalent of “tú” it's not clear what searching for ¿Tutear o no? yields only Spanish language results. Some terms will survive translation quite well--the simple action verbs, names, acronyms (usually--but check! POW isn't used everywhere), trans-national company names, etc. There isn't a simple answer to Ramon's question, but I hope this gives you some guidance! Answer: POWs in the US? I started part one by looking up Priest Lake, ID. A quick look at Maps.Google.com shows that it’s in the upper part of Idaho, about 30 miles from the Canadian border. The closest big towns are Coeur d’Alene (ID) and Spokane (WA). Next, where were the POW camps in the US during WWII? There’s a great Wikipedia page on this topic (as I guess there would be—it’s the kind of thing that Wikipedia is good at), and it lists two camps (Camp Algoma and Camp Rupert) as located in Idaho. Once you know about camps Rupert and Algoma, it’s easy to see that Camp Rupert (which I found using Google Maps) is some 600 miles away, not exactly a nearby camp. I doubt that they’d send POWs to work on trails that far away. 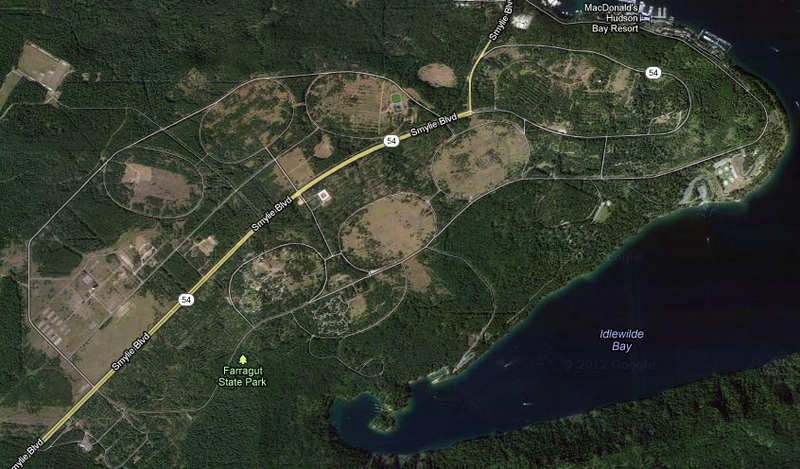 But finding Camp Algoma is a little harder. In any case, we still have to find Camps Algoma and Farragut. Problem is, the only Algoma I was able to find in Idaho is in the town of Sagle, about 60 miles from Priest Lake. (A LOT closer than Camp Rupert. Plausibly close enough.) Was it a camp? Don't know. I found a lot of information on the camp. In particular, I found that in February 1945, a POW camp was attached to Farragut Naval Training Station on Idaho’s Lake Pend Oreille (near Athol, ID) received 750 German and Austrian POWs. They were given light work as gardeners and groundskeepers and forestry related tasks. 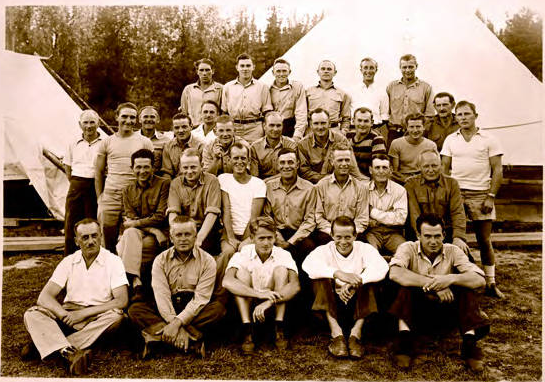 This Camp was about 80 miles from Priest Lake, and as I found in document (which is a transcribed short memoir of Joachim Oertel, a German POW at Camp Farragut), the internees did a lot of manual labor of the kind seen in the above photo, but that life in the camp was pretty pleasant. Camp Farragut today (Google Maps image). Now it's a State Park. Part 2: What did the Germans think about US POW Camps? As commentor Andreas said, “it’s difficult to quantify” this kind of question. There were propaganda issues on both sides (German and American), so this question requires getting beyond the official pronouncements. And then there’s the difficulty of discriminating between POWs held on American soil and POWs held in Europe. Andreas is right—this is a big, difficult, complex topic. Luckily, we don’t need to write a thesis on this, but try to figure out HOW we could find this information. 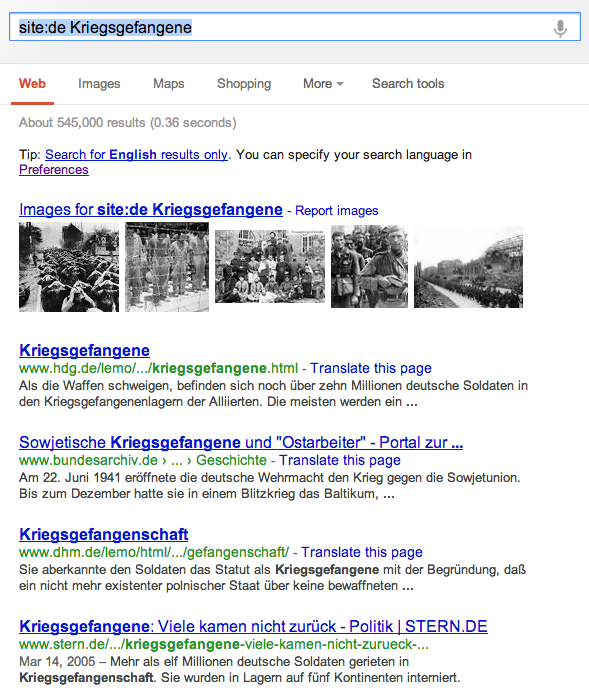 I wanted to start by searching German resources—books, newspapers, magazines—for accounts about POWs (or, using the term of art we discovered above, “Kriegsgefangene”). quickly points out the difficulty here—there were MANY POWs (German, Austrian, US, English, Soviet, etc.) and the results are large and complex. Adding in the term “America” changed my results to be ALL from a single site: Acor.de which is a site dedicated to German POWs from WWII. This is a great find, but I want to get more than just one site (which clearly has an advocacy position on this topic). It does bring up a twist that I hadn’t known about beforehand. American treatment of German POWs in Europe was apparently VERY different than German POWs in the US mainland. But from a SearchResearch perspective, the Wikipedia article also has links to writings by German authors. One of those links looked promising: Hans-Erich Volkmann (eds. ): End of the Third Reich - the end of the Second World War. A perspective review . Published on behalf of the Military History Research Institute, Munich 1995, ISBN 3-492-12056-3 , page 278. Interesting: This book is hard to find until I realized that the title would be in German. “Ende des Dritten Reiches - Ende des Zweiten Weltkrieges : eine perspektivische Rückschau.” Once I realized this, I thought I’d try to find a scanned version of the book…. But no luck. It doesn’t seem to be scanned! Notice that the completion that looks like correct German to me is [Kriegsgefangene in amerika ] (that is, America with a “K”). I WAS going to spell it as I would in the US—America with a C.
Looking through the results I was able to easily find magazine articles (e.g., from Der Speigel) and books written in Germany (e.g., Kramer, Arnold: German POWs in America 1942-1946. Tübingen 1995; or Reiss, Matthias: The blacks were our friends. German POWs in American society from 1942 to 1946. Paderborn 2002) about the experiences of Germany POWs. Answer.... I don’t want to write a thesis about what Germans thought about internment in the US, but the summary seems to be that by and large, opinion of people who knew what internment conditions were regarded the POWs as being fairly lucky to escape the madness and deprivations of Europe. Wednesday search challenge (4/17/13): POWs in the US? Photo from U. Idaho Priest Lake images collection. German internees at a camp near Priest Lake, ID (1943). Let’s use Carolyn’s question as the basis for today’s Search Challenge. This comes in two parts. The first is relatively straightforward (although it took me a few minutes, and slightly complicated for the reasons Carolyn mentions above). But the second part is really a challenge (or at least it was for me, maybe you’ll have a better time of it). You need to find German resources to really answer this question. I like this challenge because it’s the kind of challenge that’s quite possible in the age of Search Engines, but was tough to do before. As a teacher, I like this one because it asks you to view the world from someone else’s perspective—and that’s always a valuable skill to have. 2. We know there were a large number POW camps in the US for German and Italian prisoners. While it’s pretty simple to find out what public opinion was in the US of POW camps for American soldiers, can you figure out what public opinion in GERMANY was of US POW camps during the war? 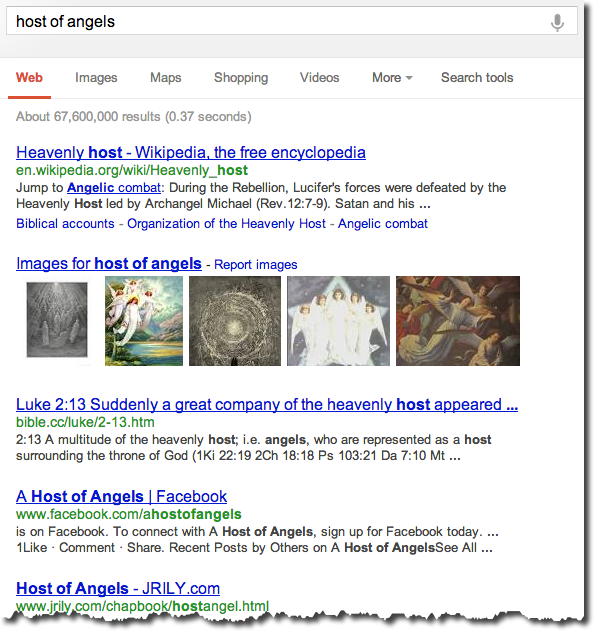 This is a somewhat more subtle search task, but one well worth spending a few minutes doing. As usual, please when you send in your answer, please let us know HOW you found it (what was your search path and what tools and resources did you use along the way), and about how LONG you spent on this challenge. Answer: When did the windmills arrive? I actually started by looking around in Google Maps. Since I knew pretty much where those windmills were, I figured I could easily spot them in the landscape. But I was wrong. After scrolling around looking for telltale shadows on likely-looking ridges, I found nothing. That’s worrisome, but okay—searches go like that sometimes. So I shifted strategies and used the “Photos” to locate a likely looking picture. 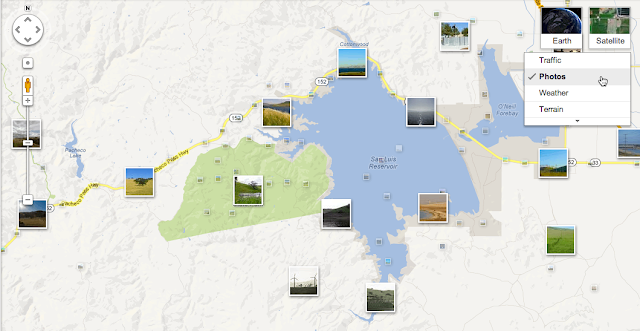 In this map, I clicked on Photos (under the Satellite view menu). Note the image with the windmill in the lower part of this image. This image is from Google Maps, which is showing Cuiet's photo from Panoramio, URL above. 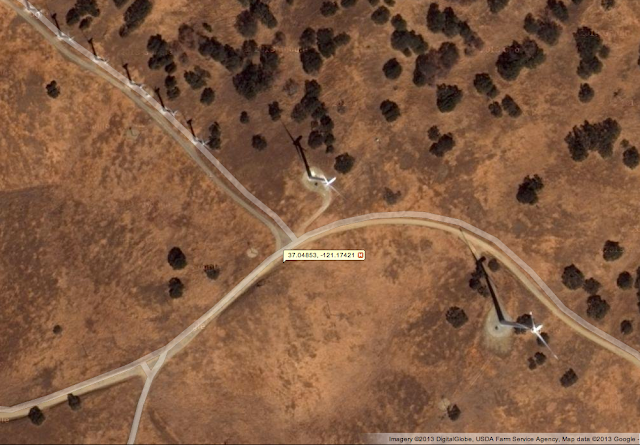 And NOW I can see the shadows of the windmills in the satellite photos. Rather than following the Maps strategy, another way to solve this challenge was through regular web search. 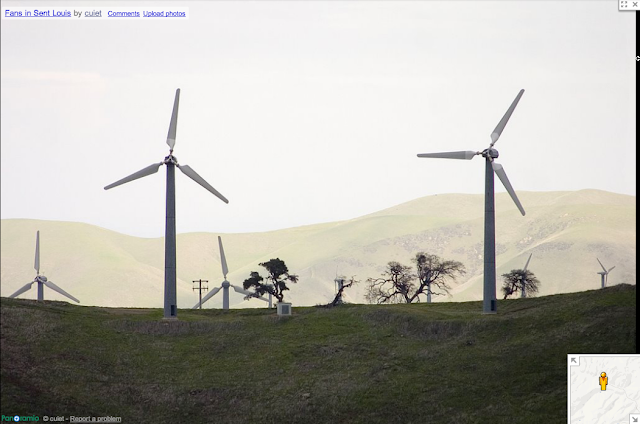 So from this I learned that the windmills are actually inside the boundary of Pacheco Pass State Park. 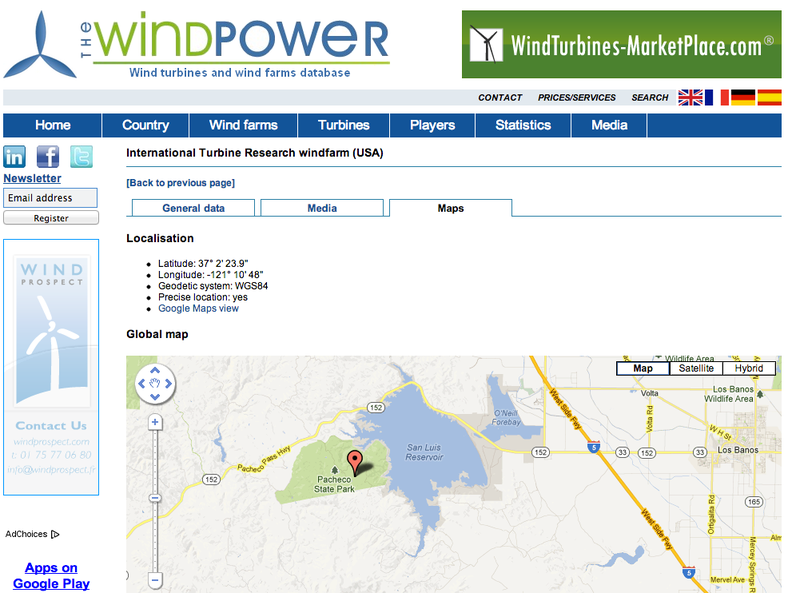 Which led me to the site for International Turbine Research--which tells me that this is developer, and I'm assuming owner, of the windmills. ITR is a U.S. corporation established in 1986 to operate, service and maintain a series of wind energy projects situated in Pacheco Pass, California, and to maintain electronics and communication systems of wind energy projects situated in Palm Springs, California. So it looks like 1986 is the year they were put up. Maybe. But I like to second source everything. So I did one-more-search… This time in Google Books (figuring that someone would have written a comment about this windy pass in a book sometime in the past 30 years). But digging a little deeper, another book: Charging Ahead: The Business of RenewableEnergy and What It Means for America, John J. Berger, I find that US Windpower leased “5,600 acres of land in Pacheco Pass” in the late 1970s. which leads me to a newspaper article in the Bangor Daily News (April 20, 1979). "A private firm plans to build 20 windmills... in a $20 million project undertaken by US Windpower, Inc."
The company, based in Burlington, Mass., was headed by "a former garment executive from San Francisco..."
Apparently, US Windpower started the project in the 1970s, started setting up windmills in 1979-1980, and then were later purchased by International Turbine Research in 1992. ITR still owns the windmills. Reader RosemaryM followed yet a 3rd path. Her method was to first look for a database with this information in it. That’s a smart move. 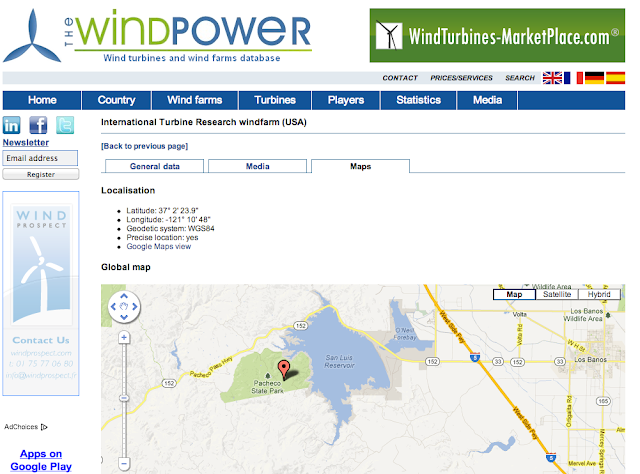 Finding http://www.thewindpower.net/ which has a great collection of datasets about windpower. This gives a pretty long list of turbine sites in California, so she used Control-F to find the term 'Research' (as in “International Turbine Research”) in the list. This leads to the page for International Turbine Research. Which shows the location of the windfarm at Latitude: 37° 2' 23.9"Longitude: -121° 10' 48". Dropping those coordinates into Maps shows you exactly where the turbines are. Once you know it’s in Pacheco Pass State Park, finding the name of the rancho isn’t that hard. The park was created from Rancho San Luis Gonzaga in 1997, five years after it was bequeathed to the state by Paula M. Fatjo. She was the great-great granddaughter of Mexican ranchero Francisco Pacheco, for whom both the park and the nearby Pacheco Pass are named. The rancho had been in the Pacheco family since 1843. 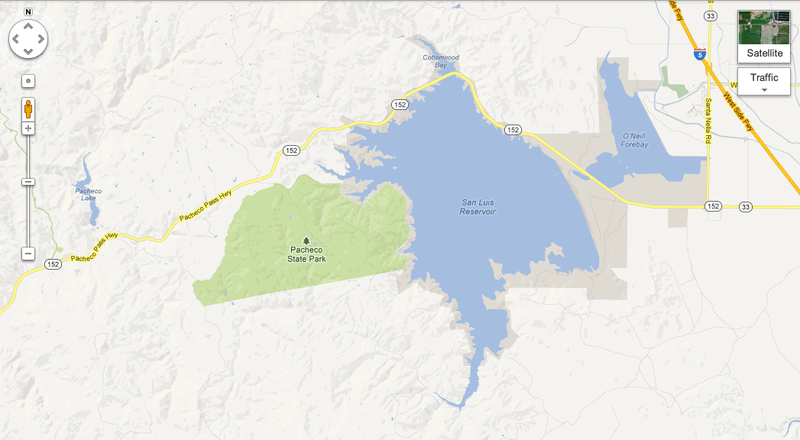 The majority of her property was condemned by the state of California in 1962 to create the San Luis Reservoir. And, as regular reader CMoore points out: "Interestingly, according to Pacheco State Park General Plan and EIR, the ITR Facility was not the first "wind-powered" installation at Pacheco State Park/Rancho San Luis Gonzaga; during the Rancho San Luis Gonzaga's time as a working ranch a windmill was located on the property and the ruins of that windmill, built in the mid-to-late 19th century, were identified as a historic/cultural resource." There are many lessons here, but the most obvious one is this--there are often many ways to skin a cat, or find the ownership of a wind turbine farm. Also, as you see, sometimes one needs to dig a bit more deeply into the backstory to figure out what really happened. Yes, ITR owns the turbines now, but there's probably a fascinating story about what happened to US Windpower during the 1980s and early 1990s. But that's for another day. Answer: How to find the conference proceedings?